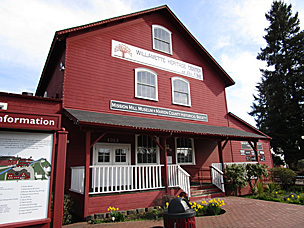 The Willamette Heritage Center occupies the historic Thomas Kay Woolen Mill and surrounding grounds in Salem, Oregon, just a few blocks from the State Capitol. 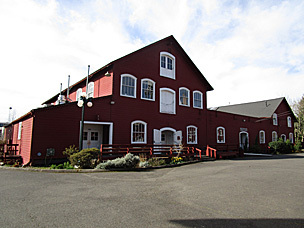 The main entrance, gift shop, cafe, and a few other spaces are located in the warehouse, while the museum occupies the first two floors of the mill as well as a few attached outbuildings. There are also some historic houses on the grounds. 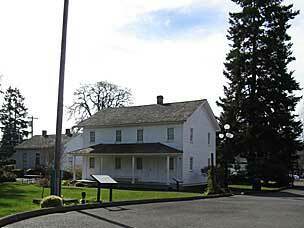 Jason Lee was a Methodist missionary who traveled overland from Missouri to Oregon in 1834 and established a mission, first in a soggy bend of the Willamette River (now Willamette Mission State Park), then on better ground in what would become Salem. The 1841 Jason Lee house and 1841 Methodist Parsonage are both part of the tour. A sawmill was constructed around 1841 on Mill Creek, and a canal (the Salem Ditch) to the larger North Santiam River connected in 1857. Mill Creek had been seasonal, but with the constant flow from the North Santiam River via the Salem Ditch, there was enough water to run the new Willamette Woolen Manufacturing Company mill near where Mill Creek met the Willamette River. The Waller Dam was added around 1864 to split off a mill race. This mill race supplied the Pioneer Oil Works (that’s linseed oil, not petroleum), and other industries. Yorkshire-born Thomas Lister Kay emigrated to New Jersey and worked as a weaver in the woolen mills as he had done in England. 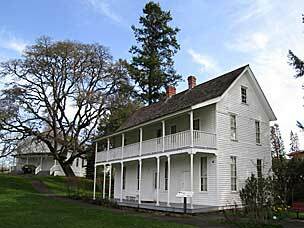 In 1862 he took a mill job in Brownsville, Oregon, eventually becoming a part owner. After that partnership was dissolved in 1888, he purchased the Pioneer Oil property (their building had apparently burned down) and began building his own woolen mill, with the help of local investors. Drawing on his experience and connections on the east coast as well as back in England, he ordered the finest machinery to be sent around Cape Horn and utilized all the latest techniques. 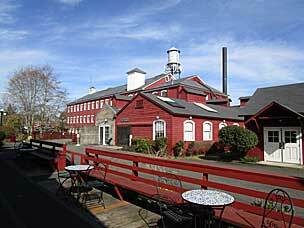 The first wooden building was destroyed by fire in 1895; the new brick mill stands today. Thomas Kay died in 1900, but his descendants continued to own and operate the mill until it closed in 1962. Meanwhile, in 1909 Thomas Kay’s eldest daughter and husband C. P. Bishop took over the idle Pendleton Woolen Mills in Pendleton, Oregon. Their descendants still run that company today. In the photo above, the shed-roofed section on the left end was originally an open loading dock, primarily for the dye powders used to color the wool. The gabled two-story section next to it was the Wool Warehouse, where bales of raw wool came in from the sheep ranchers; it’s now the front entrance and the cafe. The low section to the right of that was open, with loading docks on either side. The gabled section on the far right was the Rag Warehouse, where old woolen rags were collected to be recycled. You can either choose a guided tour with a docent, or go around on your own with a key to unlock the doors. I chose the latter option, so I could move at my own pace. However, the layout and sequencing of the different areas is… well, it’s just confusing. About halfway through my tour, the docent came by and turned on one of the machines for me, and about that point I thought “I should have just let her take me around”.